This 'one-side only' live album, recorded in 1979, captured two of the eras contributors to what was the UKs upcoming electronic underground music scene, which rode a parallel with the underground punk / post-punk developments. It would also lead to a story of determined success and also to an untold story of mystery and tragic loss. Daniel Miller (aka The Normal) was a Film Student in the early 1970s and also spent some of his creative time as a DJ. He had also read J.G. Ballard's 'Crash' and had become very inspired by the themes within the book, whilst also indulging in his love for Krautrock and in particular, Kraftwerk. He had set upon creating a script for a possible film project concerning Crash with some of his associates, which actually led to some (at first) possible interest in europe. This third party of interest sadly faded away and as time passed, Miller was immersing himself more in music. Whilst DJing in Germany in 1976, he had heard The Ramones and was taken aback by the simplicity and repetative drive of their sound. Thinking back now, you could imagine how ideas were bouncing all around his mind- the possibilities of a pure, uncompromising electronic music, the hypnotic theory of repetition, not to mention the stark, shocking imagery of Ballard's novel. He would record "Warm Leatherette" and "TVOD" in 1977, eventually releasing the two tracks on his newly formed Mute label in 1978. "Warm Leatherette"-just over three minutes of pure abject tension, was duly travelling down the dark side of the Autobahn, whilst "TVOD" possibly touched on themes that the writer William Gibson would later unfold in the next decade. Robert Rental, a Robert Wyatt lookalike (circa 1969) from Port Glasgow, travelled down to London with fellow scotsman Thomas Leer, to take part in the action that 'Punk' had thrown open to all and sundry. After connecting to like-minded folk and trading ideas (especially with Miller), they soon found themselves being part of, and pioneering, an embryonic pulse that would filter through to underground and popular musics to this day. Robert Rental released "Paralysis / ACC" on Regular Records, whilst Leer released "Private Plane / International" on Oblique Records, both releases surfacing in 1978.
things of the time- all discordant guitars, effects-laden vocals, a derailed stylophone and bursting with shards of sound, hard to describe...even today. He had also turned Throbbing Gristle's Chris Carter and a young pre-Whitehouse William Bennett, onto the marvels of the cheap and effective Wasp synthesizer. Carter was also very impressed when he heard tapes of Rental's recorded material. Meanwhile, Daniel Miller also helped Bennett with his first recordings, these materialised under the name of Come, which brought forth the 'Rampton' LP. Around this time, Rental and The Normal got together to do some live support slots for Essential Logic (for a brief spell Bennett was one of the guitarists) and also the Belfast heroes, Stiff Little Fingers, who were promoting their "Inflammable Material" album. The recording of 'Live at West Runton...', isn't the best live recording around, I mean, it's not as cruddy as, for example- 'Live at Max's Kansas City'- and if the volume is cranked up, it can be quite visceral, but there is a strange and perculiar aura about it, even though it can sound quite tinny in places. Nevertheless, it's an important document of the time. It consists of five 'segments', starting with a knocking, ring-modulated rhythm with spits of noise and taped speech fragments, it must have been a bit of a shock for most of the audience present, who were probably expecting some guitar power chords and singalong action! This opening section suddenly stops to go into a tape of some orchestral swing music, whilst Miller deadpans something about "dead reptiles". The swing fades out to a one-note percussive synth sound, it's like Rolf's 'sun-arise', but meant for the apocalypse! Rental starts hollering his fears, which you can't really understand what he's shouting about, but they sure sound anguished, while swathes and blasts of white noise slowly lead to a cacophony of taped splinters, before a hovering drone starts to blanket the overall sound. There is a few seconds snapshot of the stuttering 'TVOD', which is then lost into wrestling with the drone. A synth sequence starts to poke out, but once again succumbs to that blanket drone. The last leg of this 25 minute set, has a a sharp staccato synth sequence while once again, Rental bellows with some force into the microphone. At intervals, this electric and puncturing staccato is interrupted by superb, full blocks of shimmering sound and alternately repeats with the juttering sequence to great effect, until the whole thing is wound down like a beast well and truly slayed. I think they won the audience over that night, as a small but healthy enough cheer rouses up with a few shouts of "more!". I always got the impression when listening to this recording, that the performers didn't expect the positive reaction, as you can hear Miller utter a slightly stunned- "thank you, goodnight", with Rental chipping in an even more brief- "g'neet!" 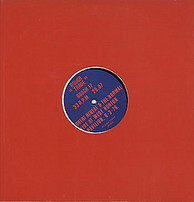 Instead of the die-cut bright red sleeve of the UK issue, the german release had a sleeve with a photo on the front, which looked like a snapshot from one of those old futurist happenings, as it displayed a row of men onstage, shouting through some large cones, or maybe it was some long lost german vaudeville ensemble. Daniel Miller continued with his Mute label, going from strength to strength and also forming various subsiduary ventures. Up to today, he has built up a (very) sizeable establishment that continues to release some great new music AND re-release music which has been of enormous (and at times 'invisible') influence to many groups and artists the world over. Robert Rental recorded a truly marvellous album with Thomas Leer in 1979- "The Bridge"- which was released on Throbbing Gristle's Industrial Records label. He then vanished from the scene completely, to put all his time into his family life. Sadly, he passed away as a victim to lung cancer in november 2000. I think this live album is long overdue for reissue on CD, it would really make a great package with the rare "Mental Detentions" release from 1979 and any others (if any still exist of course). Here's to Robert Rental - Lest We Forget.